If you are visiting Pembrokeshire there are so many fabulous attractions it’s hard to choose where to go next. Below are a few of the top suggestions. And they are all within easy distance of the lovely four-star Stackpole Inn, a great place for lunch, supper, or to stay over. If you are out and about in Pembrokeshire one of the best places to end up for a memorable evening meal is the award-winning Stackpole Inn. Best Gastro Pub in Wales and Best Food Experience Pembrokeshire have both been won by this traditional inn during the last few years. The place is popular with climbers, walkers, cyclists and families and offers a great dining experience as well as top quality bed and breakfast accommodation. Pembroke Castle - one of the largest castles in Wales. The massive 75ft high keep was built just after 1200 and its walls are 19 feet thick at the base. Inside the Castle there are tableaux depicting mediaeval life within its walls, including copies of costumes, furniture, tableware, wall hangings and other artefacts found locally. Oakwood Theme Park -one of the UK's top ten theme parks and one of Wales' largest tourist attractions with over 400,000 visitors each year. Here you can find Hydro, Europe's fastest and wettest water coaster; Megafobia, the award winning wooden rollercoaster; Vertigo, a 50m sky coaster and The Bounce, an exhilarating shot and drop tower coaster. Ther are less scary rides and attractions too! It’s a place for family fun for everyone. Barafundle bay -A small bay of golden sand and clear waters, backed by dunes and pine trees, you have to walk half a mile to get here from the nearest car park. But it’s worth the walk as it is one of the best beaches in Britain. If you’re planning to visit, check out the tide times to make sure there will be plenty of beach to play on and that you don’t get cut off by the incoming tide. 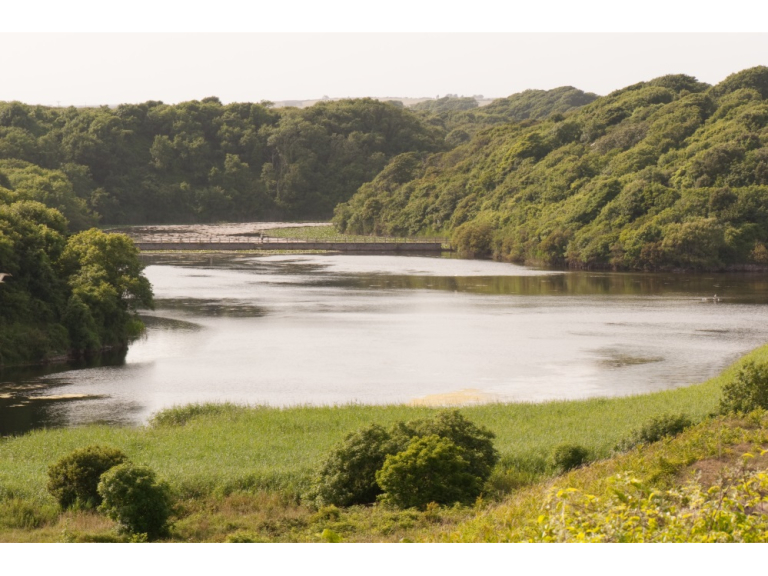 Bosherston Lakes -Best known for water lilies, which are at their best in June. A footpath winds its way around the banks of the lakes to the spectacular beach at Broad Haven South. These freshwater lakes are part of a National Nature Reserve and home to otters, wildfowl and dragonflies. The ponds also offer good coarse fishing and are well stocked. Freshwater West beach -This sand and rocky beach is the hunting ground of surfers on the lookout for the perfect wave. This south-west facing beach has the best waves in the county but it is only for the most experienced surfers. Strong rip currents occur off this beach, so it’s the best place to go to watch the surfing. Freshwater West has featured in two recent films - Ridley Scott's Robin Hood and also Harry Potter and the Deathly Hallows where it was used as the backdrop for Dobby's Shell Cottage. If you’re planning to visit, check out the tide times to make sure there is plenty of beach to play on and that you don’t get cut off by the incoming tide. Whatever your choice, the welcoming Stackpole Inn is not far away and you can look forward to enjoying a welcome sundowner and fabulous food in great surroundings at the end of a tiring day out. The selection of fish on the menu changes daily depending on the local catch. High quality cuisine, prepared using only the finest local produce and ingredients is all here. To see the businesses in our Public Houses, Bars and Inns section, please click here.